Kolbi of A Daring Adventure has moved her blog from iweb to typepad. Check out her new digs here: http://adaringadventure.typepad.com/ ; much easier to navigate and has a faster load, too! 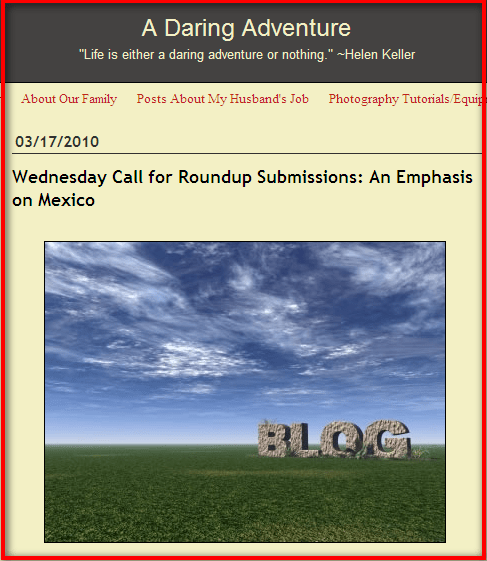 If you have not seen her State Department Weekly Blog Roundup, check out the culled weekly list here: http://adaringadventure.typepad.com/blog/blog-round-up.html. I know this is a lot of work, but I think it is appreciated by many as it facilitates better connections among the FS bloggers community. Thank you, Kolbi for all the time and attention you put into this every week! Has a State Department blog post from this week touched you? Made you laugh? Did you learn something from it? Did you find it helpful in some way? Do you think its subject matter is important or compelling? Maybe it included some great pictures… or a great story… or maybe (like what happens in my home a lot!) you liked it enough that you showed your spouse/significant other/family/friends what it had to say. Below are links to her previous blog roundups. Michael Mewshaw did a dangerous and perhaps foolhardy thing for his 65th birthday: He embarked on a 4,000-mile overland journey through the terrorist-ridden lands of North Africa. But now that his firsthand account has hit the bookstores, he says his roughest experience has come at the hands of the U.S. State Department. The department is in a snit over Mewshaw’s portrayal of his visit to the U.S. Embassy in Algiers. Mewshaw, who has written 19 books — fiction and nonfiction — popped in on Thomas Daughton, the deputy chief of mission, after an exchange of e-mails in which Daughton welcomed the writer’s visit. Their conversation was candid and jovial. In his new book, “Between Terror and Tourism: An Overland Journey Across North Africa,” Mewshaw describes Daughton as being in his late 30s and as having a “wry, wisecracking style.” It was a welcome change from what he experienced in his previous sit-down with a U.S. official. Pat Kabra, the U.S. public affairs officer in Tunis, was a by-the-book type. When Mewshaw asked her about the recent al-Qaeda kidnapping of two Austrians in the country, she recited what was in the newspapers. “She was like a recorded announcement, very cagey,” Mewshaw says. Under a state of emergency imposed in 1992, and with President Abdelaziz Bouteflika easily winning reelection to a third term, Algeria continued to experience widespread human rights violations. These included restrictions on freedom of the media and assembly, police abuse of terrorism suspects under interrogation, impunity afforded to members of the security forces and armed groups for past crimes, and continued failure to account for persons forcibly disappeared by state agents during the civil conflict in the 1990s. On a lesser scale than in previous years, militant groups continued their deadly attacks, mostly targeting the security forces. The State Department’s own 2009 Human Rights Report for Algeria is here, in case you want to take a look. Since August 2006, security forces have taken the initiative in hunting down terrorists who continue to fight and an average of 20-30 people are still killed monthly country-wide. The al-Qa’ida in the Islamic Maghreb (AQIM) group committed a number of spectacular suicide attacks, kidnappings, roadside bombs, and assassination attempts throughout the country as well as in Algiers. With the perceived success of the kidnapping of two Austrian tourists in Tunisia, terrorist groups increasingly appear to regard such activity as a means of obtaining revenue. While the predominant targets remain wealthy local businessmen, the potential for a western target of opportunity exists. He joined the U. S. Foreign Service in 1989 and has served in Kingston, Jamaica (vice consul, 1989-91); Rabat, Morocco (political officer, 1991-93); and Thessaloniki, Greece (consul, 1997-2000) as well as in the Department of State in Washington, D.C. (1993-1997). From 2000-2003, Mr. Daughton was Deputy Chief of Mission and Chargé d’Affaires, a.i. (2001-2002) in Libreville, Gabon. That assignment was followed by a posting as Counselor for Political Affairs at the American Embassy in Kuala Lumpur, Malaysia. Prior to arriving in Beirut, Mr. Daughton served for three years as Deputy Chief of Mission at the U.S. Embassy in Algiers, Algeria. Mr. Daughton is a graduate of Amherst College and the University of Virginia School of Law. Prior to joining the Foreign Service, he was an associate at a law firm in New York. He speaks French and Greek. Had Mr. Daughton just recited the Crime and Safety Report and the HR Report for Algeria and avoided calling those folks, reportedly “backward and authoritarian leaders who disregard human rights,” perhaps this kerfuffle could have been avoided? And oh, please don’t call an ally “sclerotic and self-serving,” that doesn’t sound nice; they might take offense if they hear the truth. “Between Terror and Tourism: An Overland Journey Across North Africa,” was published by Counterpoint (February 16, 2010; 384 pages). You probably can find Tom Daughton in the index. See — now I have to buy the book; wouldn’t have heard about it had the State Department not complained about it. H.R. 1299, the “United States Capitol Police Administrative Technical Corrections Act of 2009,” which establishes a Corporation for Travel Promotion to encourage international travel to the United States; and makes miscellaneous amendments to authorities of the United States Capitol Police.